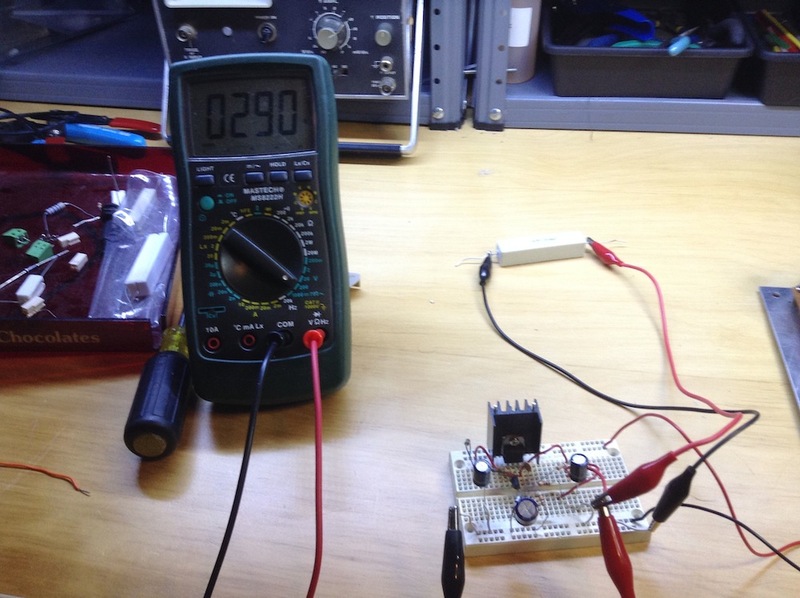 When I last left the pre-regulator for my bench power supply, it was an a sort-of-works state. To recap, I need a pre-regulator to drop some excess voltage from the mains power supply board so the voltage regulators don’t melt from too much voltage differential. What I had was possibly the simplest voltage regulator one could build (apart from a simple resistor voltage divider). 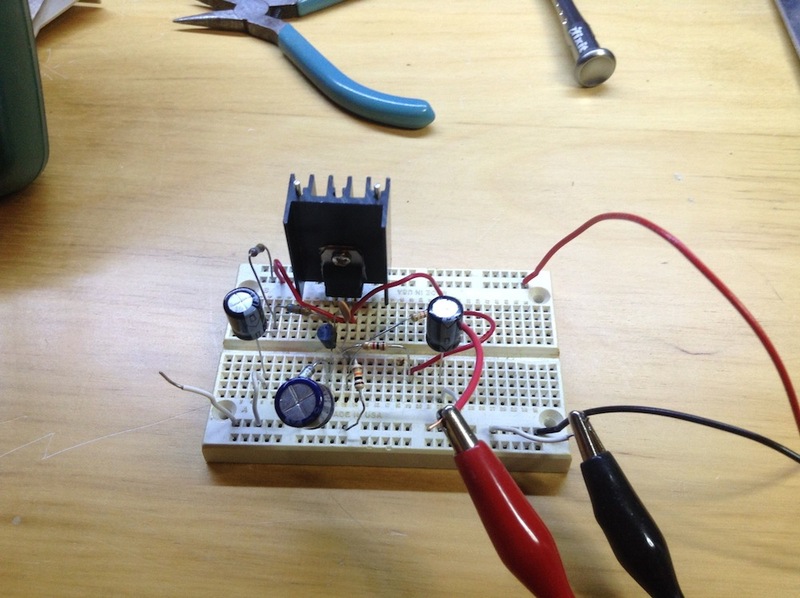 It was simply a pass transistor, a zener, and a resistor to set the zener/base current. It worked, after a fashion, but the load regulation was terrible. 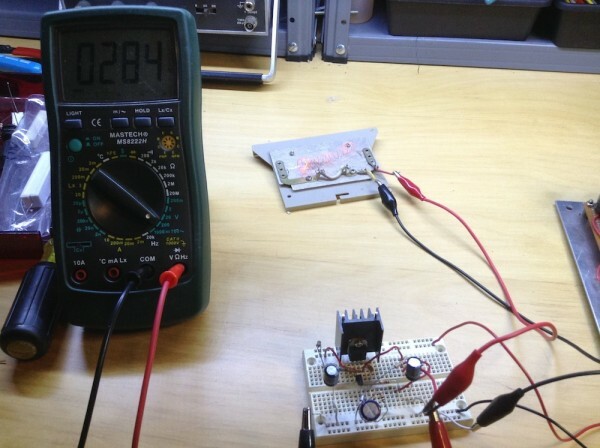 Depending on the load, the thing’s output would swing between ~30V unloaded to a dangerously low 25V under a 3A load. I say dangerous not in the electrocute-your-face-off sense, but because it’s cutting into the dropout headroom I had for various voltage regulators like the 7824 and to allow the LM317 to hit 24V under any load from nothing to 3A. That obviously was not going to work, or if it did, it would be bleedingly close to pooping out on me. Not how I want my first big project to function! It dawned on me that what I needed was some feedback to whatever was setting the voltage to what it’s output actually is. It doesn’t just know it by magic. After messing about on the breadboard with rudimentary ways to tie the output to the base of the pass transistor, I googled about. I came across a venerable site I’ve been reading for years, and a solution. Elliott Sound Products (UPDATE: Unfortunately it is no longer there, I will miss this site) is a marvellous electronics site authored by a very experienced and instructive gentleman with a heavy focus on audio amplifiers and analog signal processing. Integral to all amplifiers are symmetrical power supplies and various voltages at play that are higher than your typical 5-12Vdc. Often times, stock voltage regulators like the LM78xx and LM317s will not be able to fit the bill due to high voltages or voltage differentials, not to mention high currents. In his article section, he has authored a quite excellent overview on various types of voltage regulators and wonderfully detailed explanations on how they work and caveats etc. In a nice change from earlier today, I was extremely impressed! Having done up the circuit in simulation beforehand, I expected an output of 28.72V which turned out to be 29V pretty much on the nose, unloaded. Fantastic. What’s more, it remained almost perfectly stable when loaded with various loads, dropping slightly to 28.4V under my 10Ω heater (dummy load) which makes for success at my stated maximum of 3A. By adjusting the ratio of the 12kΩ/10kΩ voltage divider, I can fine tune the voltage I want and I fully intend on dropping it down to about 27V or just above to keep the ceiling low but with enough headroom so there are no dropouts. Too easy. Another thing that impressed the pants of me is the ripple on this guy. I had stated in a previous article I was getting the nothing-to-sneeze-at ripple of only 6mV which is quite excellent. In measuring with the new pre-regulator, I found it very difficult to measure any ripple whatsoever! I can still see a vague distortion of the line and estimate my ripple is sitting at about 1mV which is just stellar. This brings up another point and something I also learned from ESP (Elliott Sound Products) is that it’s perfectly accepted practice to cascade voltage regulators for better ripple and regulation and this is indeed done all the time. Well that seems to be proven!